Looking to enjoy an evening at Mompou Tapas Bar & Restaurant in Newark, NJ? Book your table in advance by making your reservation online! Just put in the date and time, as well as the number in your party and we’ll look forward to seeing you. For reservations of 8 or more, please call us directly at: 973-578-8114. Join us for paellas and películas as we kick off our Spanish Cinema Film night April 26th at MOMPOU! 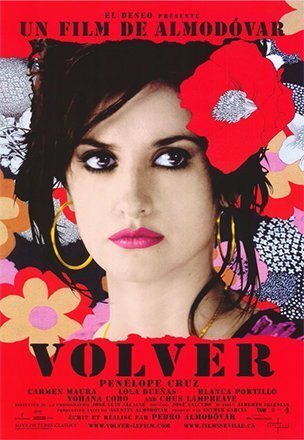 We’ll be screening Volver (2006), a captivating drama by one of Spain’s most cutting-edge and reputable directors, Pedro Almodovar. Transport yourself to Madrid as you enjoy an evening of Spanish cuisine and culture with us. Space is limited, so purchase your tickets in advance. Food and beverages not included in ticket purchase. Screening starts promptly at 8pm. Seating begins at 7:30pm. Reservations automatically updated with ticket purchase. Enjoy dinner and drinks at Mompou before or after a Prudential Center event. Book a reservation now to secure your table. We fill quickly on event nights. I came here for the first time, and I was very happy with everything. The ambiance was fantastic, the food was amazing, and Ruben was phenomenal!! Ruben was very attentive and on point with everything. He constantly checked up on us to ensure that everything was ok. I can't wait to come back. Thank you. This restaurant was absolutely worth it!! The scenery was beautiful & felt like you were in Spain, so definitely sit outside! The food was amazing & the best paella I've ever had, was here. Our waiter Leo was great and very attentive and welcoming. This place is a must visit. Great location for a pregame at the Pru Center. The tapas here was very good. Decor is nice, the bar was pretty lively for a Wednesday night and the wait staff was great. Perfection! I love cozy sit downs with warm lighting, a vibing playlist in the background, delicious cocktails and small plates of beautifully made (and tasting) foods. The staff couldn't have been anymore on point with their (appropriate amount of) attention to service - Thank you! Mompou, positively, stimulated my senses and I can not wait to go back for more! I am impressed every time I go. They are so welcoming. Food is extraordinary. Service with a smile at all times. They have the right business model. Only my second time here and I think it’s in my top five of NJ restaurants. Everything was delicious and the service was great!! Looking forward to my next visit! Inspired by the ​creative and ​energetic essence of the tapas culture of Spain, ​​Mompou​ endeavors to introduce​ our guests to the beauty of our ​vibrant ​homeland through​ a combination of​ modern interpretations of traditional Spanish cuisine, innovative​ cocktails, and ​small vintner wine selections​. Our thoughtful​ and heartfelt​ approach to menu development, flavor combinations, and plating​,​ take center stage​.​ ​This is complemented ​by our ​focus ​on extraordinary service and ​our guest​’s​ overall experience. Mompou​:​ redefining the Ironbound​​ experience since 2005. Host your birthday, corporate event, holiday party, shower or wedding with us! We have a variety of areas, menus and bar packages to make your event unique and memorable. At Mompou Tapas Bar & Restaurant in Newark, NJ, we offer a wide-ranging menu that is sure to tantalize your taste buds. We offer lunch and dinner options as well as wine and cocktails to properly compliment the meal. Stop in today and taste our delicious dishes for yourself. An ideal gift for anyone! $25, $50, $75, or $100. 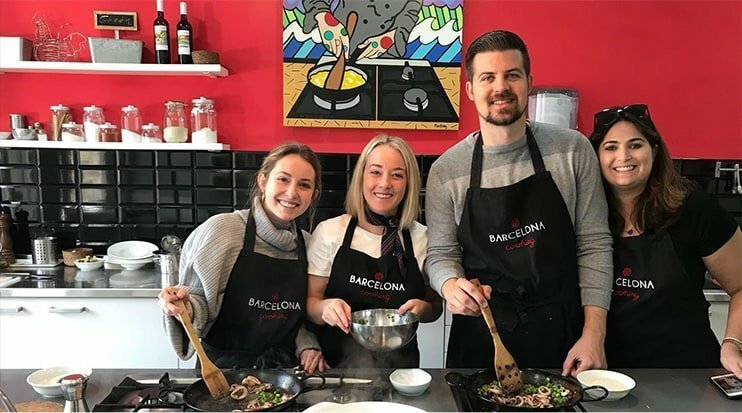 Barcelona Cooking, based in the heart of Barcelona on the world famous Las Ramblas, offers a 4 hour Boqueria market tour and cooking class that is rated one of the best in all of Barcelona. Want to learn how to prepare our tapas, or learn how we make our authentic paella here at Mompou, then this is the class for you. Taught in English by our Spanish and Catalan chefs, this is an experience you will want to have. Click below to visit the website for more information, or next time you stop by Mompou, lets have a “copa de vino” and we can tell you all about it! Mompou Tapas Bar & Restaurant is conveniently located within walking distance of Penn Station Newark, Prudential Center, NJPAC, and the Red Bull Arena. We recommend to our guests that are driving to us to park across the street at the Iberia parking lot. This lot, in addition to being the main lot for the Iberia restaurant, is a Newark Municipal parking lot and available to anyone visiting the Ironbound section. Please note there is a fee for parking. J&L Parking is another option, on Ferry St., located two blocks from Mompou. © 2019, MOMPOU Tapas Bar & Restaurant. All Rights Reserved.